Polyester carpet is a common carpet fiber that has been around a long time. It is one of the most popular types of synthetic carpet on the market today, besides nylon. While polyester is a great choice, it is important to know its pros and cons before deciding on a polyester carpet. 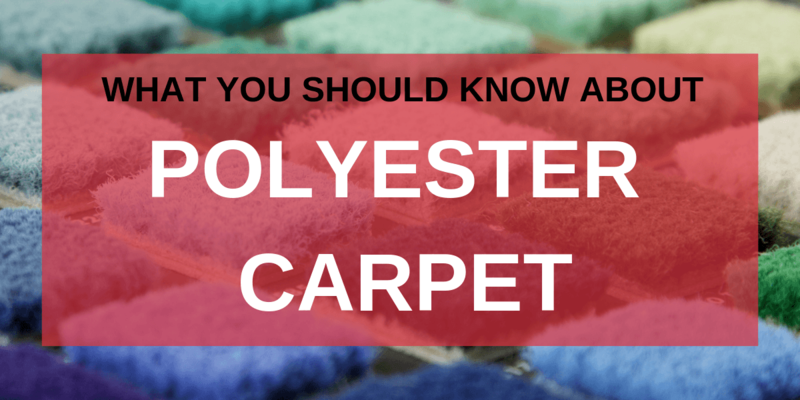 If you are looking for a budget-friendly carpet, polyester is a good choice. It costs much less than nylon, but it is important to know that it will not have the longevity of nylon. You should not expect it to last more than five years or so. Because of its affordability, it makes a great option if you are expecting your carpet to get beat up either by pets or kids or if you are looking to put flooring in a rental property. Polyester is commonly made from recycled materials. It is an excellent option if you are looking for an eco-friendly flooring that, but do not want a hard flooring like bamboo or cork. Polyester carpet is not very durable. It mats easily and will quickly start to show wear in heavy traffic areas. It is better suited to lower traffic areas like bedrooms if you want to extend its life. One great benefit to polyester carpet is that it is very stain resistant to most stains. It is susceptible to oil-based stains, so you’ll want to be careful about removing your shoes and keeping grease away from your carpet. Keeping your socks on will also help to protect it from the oils on the bottom of your feet. If you are looking for a bright and vibrant color for your carpet, polyester will be your best bet. It takes dye very well, making it available in a wide range of colors. It also is fade resistant, allowing that vibrant color to last for as long as the carpet does. Polyester carpet is a great carpet fiber with many great benefits. Like any flooring option, though, it is important to understand its pros and cons before choosing the flooring that works for you. Stop by Carpet Depot and let us choose the best flooring for your home, your family, and your budget.